New and improved Joker™ products! Cryptozoic Entertainment and Hobby World’s hit party game ‘Spyfall’ returns this summer with a new secret ingredient: Smilex! The Joker is on the loose! The Clown Prince of Crime is up to some new tricks. His latest venture finds him causing chaos by infiltrating different locations all across the DC Universe. His cover is so good, even HE doesn’t know where he is! The Justice League is aware of his antics and the Heroes have decided the best way to find him is to have everyone start talking. Will The Joker say something that blows his cover? Or will he get away with his dastardly plan? If you haven’t heard of ‘Spyfall’, I reviewed the game a while back. It’s a quick social deduction card game for 3-8 players that takes place over eight-minute rounds. Every round, one player is randomly dealt a Spy card and the rest of the players are all dealt a card depicting the same exact location. Players who receive the location card have to ask each other questions to try and expose the Spy among them without giving the identity of their location away, while the Spy must use bluffing tactics to stay hidden and figure out the mystery location of everyone else at the table. 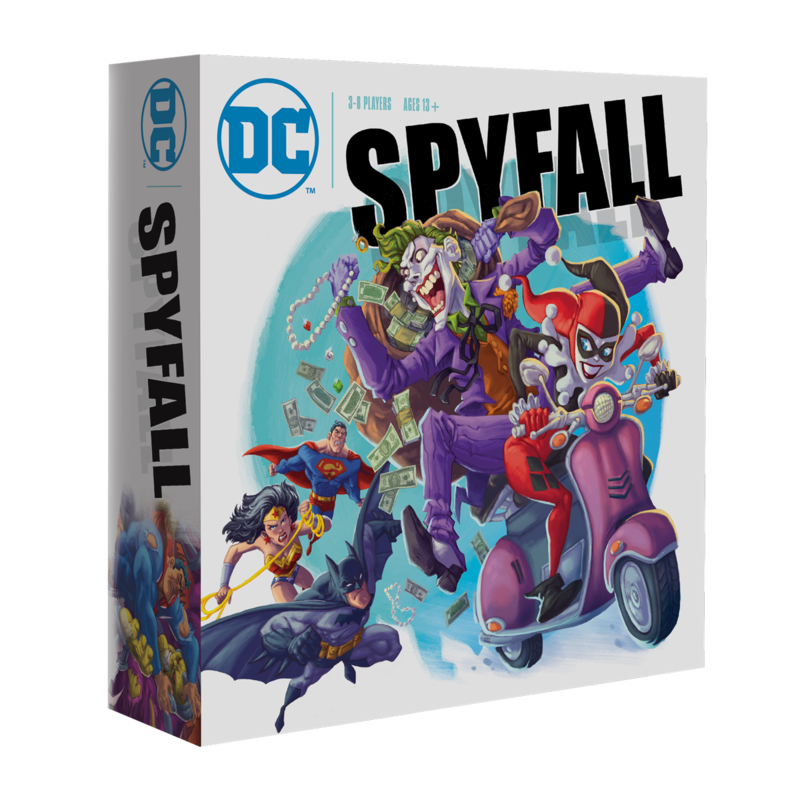 ‘DC Spyfall’ is essentially the same game, except that it’s entirely themed around the DC Universe, featuring comic-inspired artwork with the Spy being replaced with the Joker. Harley Quinn Helper – In each of the 20 basic 8-card decks, one of the seven location cards has a Harley Quinn icon on it. 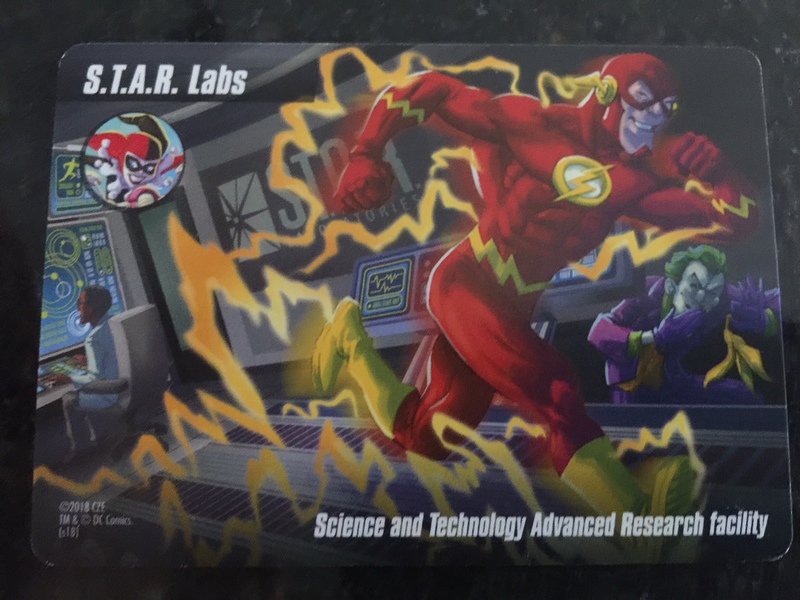 If playing with this module and a player receives the card with this icon, it means that they’re secretly trying to help the Joker even though they don’t know who the Joker is. The Harley Quinn player has to be very careful with their responses, because not only can she lose if she’s called out as the Joker, if the Joker guesses the location correctly, the other players can still win if they can identify Harley Quinn. The Harley Quinn icon is simply ignored when not using this module. 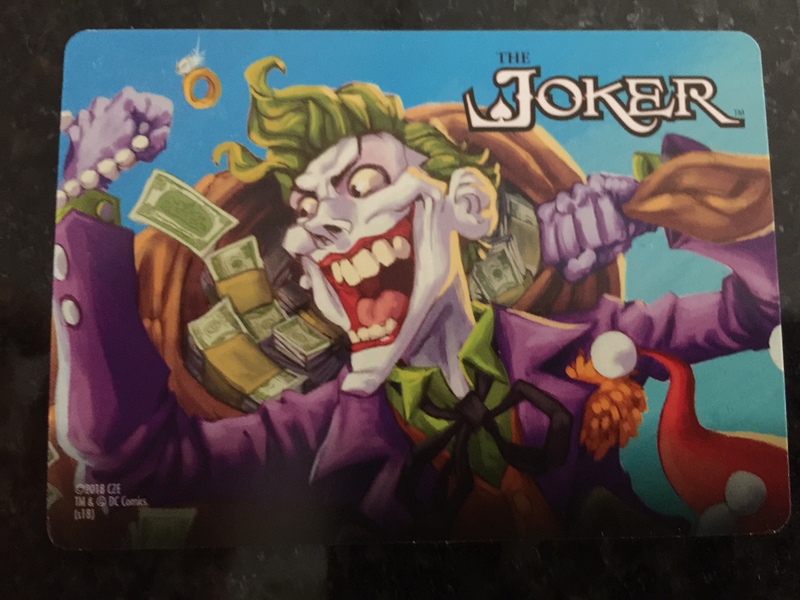 Joker’s Jest – For even more insanity and hilarity, mix this deck composed entirely of Joker cards into the pool of basic decks. 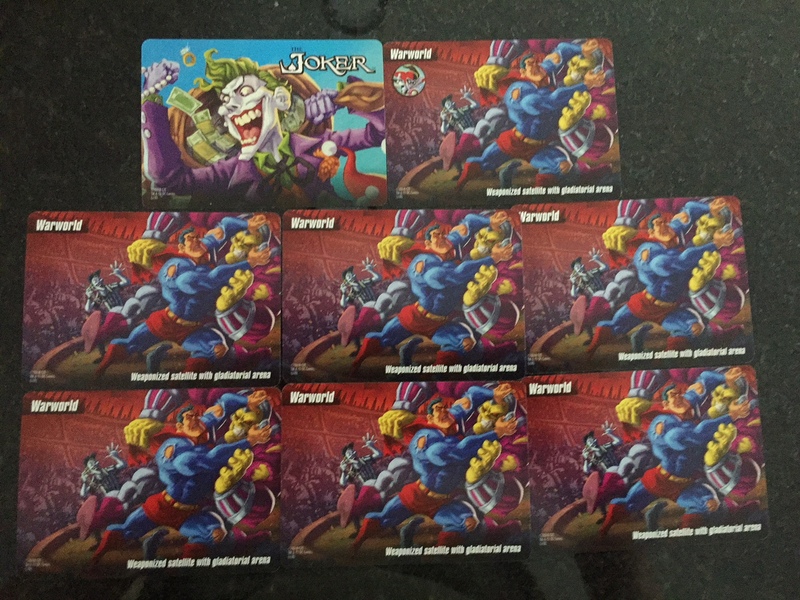 A player wins (or scores points) by revealing their card and correctly guessing everyone has a Joker. Otherwise, the Heroes win the round. Multiverse Madness – This one is similar to the Joker’s Jest module, except it uses decks of eight different locations instead of eight Joker cards. The box includes an extra copy of 16 locations to make two different Multiverse Madness decks that can be mixed in with the basic deck pool. 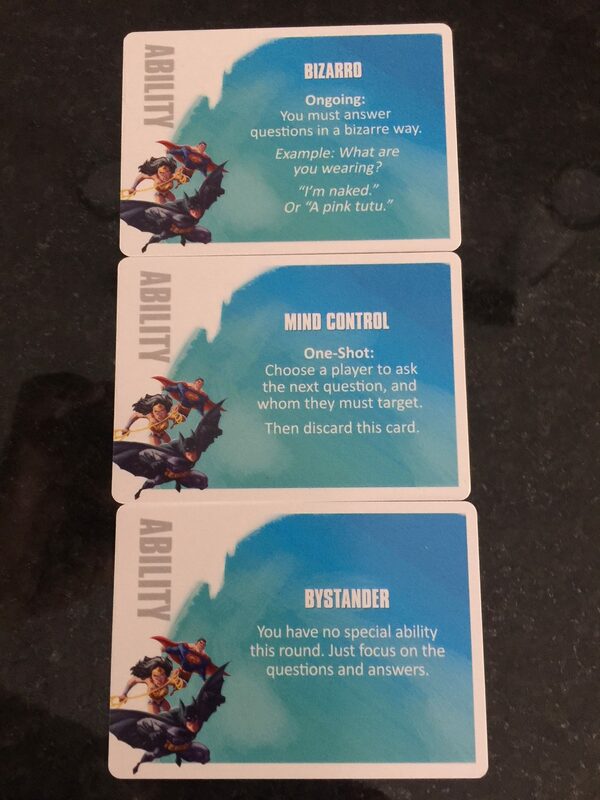 Powered-Up – The final module uses a separate deck of 12 Ability cards. Players are each dealt an Ability card at the start of each round, and these cards generally tend to change the way you play. Some are Ongoing (last the entire round), others are One-Shots (basically can be used once per round). There are even Bystander cards that don’t do anything at all. ‘DC Spyfall’ is actually the third game in the series. ‘Spyfall 2’ was released last year and introduced 20 new locations, a higher player count (up to 12) and the potential for a second Spy player. The DC re-skin is closer to that one in terms of content (although ‘DC Spyfall’ goes back down to eight players max), but offers a bit more than either of the previous two entries with the inclusion of the four modules. The humorous art is similar across all three versions of ‘Spyfall’ and the cards all share the same card back design for compatibility. That being said, I’m not sure if you’d really want to mix games because more locations would make things even more challenging for the Spy – but it’s still nice to have that option available. As for the gameplay, all versions of ‘Spyfall’ are quick, highly engaging, and can provide hours of fun practically anywhere. The game is also easy to learn and teach. Most people should catch on to the kinds of questions that should be asked among the group after just one round of play, and once they get the hang of the game they’ll likely want to play it again. At first, I thought the locations in ‘DC Spyfall’ could be problematic, especially for people who aren’t DC Universe fans, but fortunately this turns out to not really be an issue at all. Like I mentioned previously, the locations have text on them so that if someone doesn’t know what the Fortress of Solitude is, for example, the statement “Sanctuary of Superman in the polar wastelands” should be enough to give them a good general idea of what/where the location is. Plus, it’s not that hard to go over the different locations that may be used during a game with the group beforehand just to make sure everyone’s on the same page. One thing I would have liked to see with ‘DC Spyfall’ is that it would have been helpful to include individual player aids for use during a game. It’s difficult enough for the Spy to blend in as it is ,and it’s even tougher when you don’t have much to rely on except from memory. The game does include a two-page centerfold in the rules booklet showcasing all of the locations, and the rules do recommend passing this spread to whoever is being asked a question to help make the Spy less obvious, which is great. However, it can be a bit awkward passing the sheet around. Perhaps an oversized card with every location and their text listed on them to hand out to each player would have been more practical, but this is just a minor complaint. ‘Spyfall’ is one of the more accessible social deduction games out there and is definitely among my favorites. It’s amazing how a game that is so simple can be so clever and still offer a high amount of replayability. ‘DC Spyfall’ takes an already great game and makes it even better – especially if you’re a huge fan of DC Comics. Even if you aren’t, the modules are a worthwhile addition and you don’t have to be very knowledgeable about the DC Universe to have an enjoyable experience. Of course, if you’re easily frazzled or have a hard time coming up with timely questions and answers, then ‘Spyfall’ may not be for you. However, if you love games with social interaction and plenty of laughs, then you should be very happy with the purchase. Recommended. ‘DC Spyfall’ will be available this August and can be pre-ordered from Amazon for $25. Tom Landy has published numerous collectible gaming articles in Scrye and IQ Gamer magazines before eventually shifting his focus to film when he became a contributor at DVDTOWN in early 2008. A year later, Tom joined the team at High-Def Digest where he continues to write Blu-ray reviews and reports disc-related news. This is a surprise. Is HDD covering card games now? And I’m sure the definition on those cards is also really high, LOL.